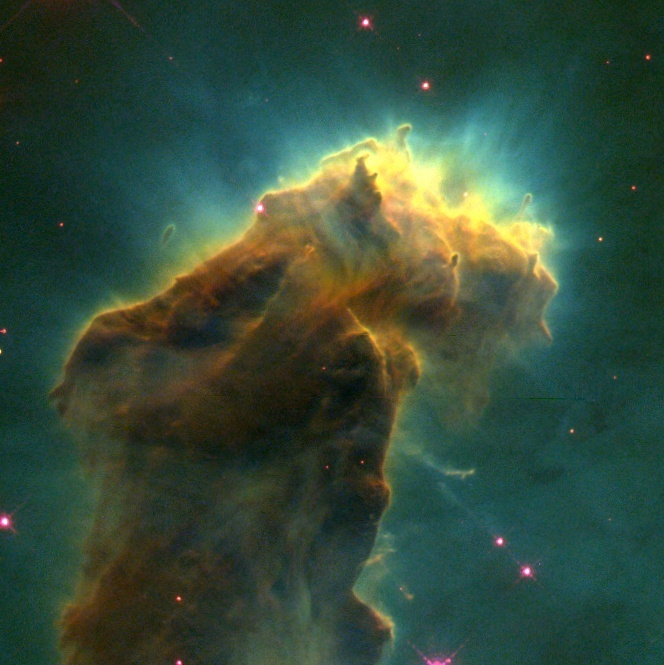 The pillars in the Pillars of Creation are overdensities of gas that have not been ionized by the stars. Their edges thus comprise part of the ionization front. Hα emission (in green) traces the density of ionized hydrogen gas. When hydrogen is ionized and then recombines, the atom often cascades through the different energy levels to the ground state. Hα is the transition from the third to the second level. We can see a gradient of Hα emission up to the ionization front, corresponding to a gradient in gas density. When the gas at the ionization front is ionized, it is heated and wants to expand. The neutral gas is cold and dense, so it is easier for the newly ionized gas to expand into the ionized region. This expansion creates a photoevaporative flow into the ionized region, normal to the interface. Bertoldi (1989) finds that this flow should have the profile . OIII emission (in blue) indicates the temperature of the star. High energy radiation is needed to ionize oxygen twice, and hotter stars emit more high energy radiation. Finally, SII emission (in red) traces the ionization front. Sulphur is very easy to ionize twice, so singly ionized sulphur is found when doubly ionized sulphur gains an electron from a hydrogen atom: S++ + H0 → S+ + H+. The neutral hydrogen density rises rapidly at the photoionization front, and so does the singly ionized sulphur abundance. Look at the density gradient and compare it to the Hα emission. Increase the temperature of the nebula’s star to see the OIII emission increase. Increase the ionization parameter and see the ionization front advance (and the SII emission peak with it). Increase the metallicity. This increases the abundance of oxygen and sulphur, which you might expect to increase the emissivity of OIII and SII. But the intensity of OIII and SII emission does not seem to depend much on metallicity; what other mechanism is at work to reduce emissivity with increased metallicity? Find the set of conditions that best matches the Eagle Nebula.